Some dogs love getting scrubbed in a nice warm bath, while others need a bit more coaxing. To make bath time for your dog less stressful, you can provide tasty treats, become more prepared, and keep your sense of humor. When you say “Time for a bath”, your dog probably runs the other way. But diced hot dogs are a great way to get them into the tub. Cut them into pieces about as big as the tip of your pinkie and drop them in a plastic bowl. (Steer clear of glass in the bathroom.) If your dog has their own favorite treat use it as a way to get them in the bathroom with you. Run the bath while you’re chopping the hot dogs. Get your towels and bath mat out ahead of time too. When you’re ready, say “Time for a bath” in a cheerful voice. If your dog hides when you first say “Bath time”, wave the bowl of treats in front of their snout. If possible, ask a friend for help. 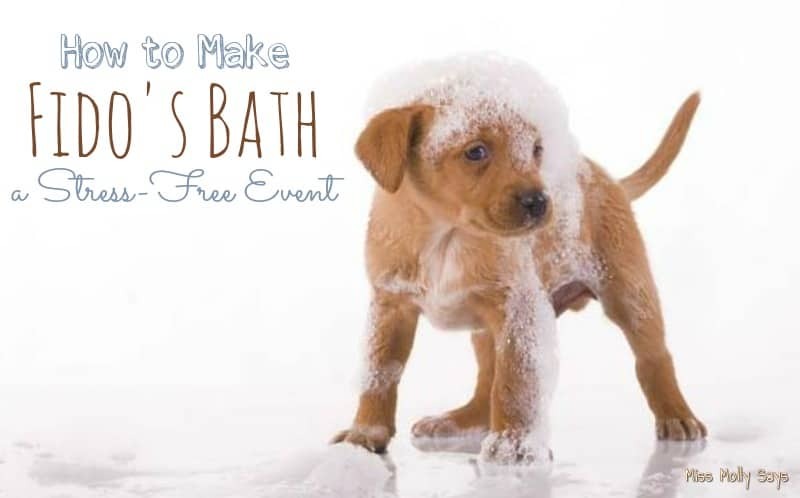 Perhaps you can ask one of your kids or a friend to dispense treats while you bathe the dog. If your dog has sensitive skin, try a gentle dog shampoo or brand with natural ingredients or labeled a natural dog product, like Roxy’s Remedies soothing shampoo. If you have a detachable shower head, spraying the dog is easy. If you don’t, you might want to use a large cup. After the tub has about three inches of warm water in it, you can lead your dog in with a treat. Once sitting, you or your partner can feed the dog in between dumping water over them. Follow the instructions on the shampoo bottle, and then wash the dog’s back, belly, and paws. In order to keep them calm, talk to them in a cheerful voice. Most dogs also love a massage. Instead of using bath towels, you might try beach towels to dry your dog. If they try to shake, say “No shaking” and give a treat if they listen. As you’re letting the water out of the tub, rub the dog down with the beach towels. Dry the ears, belly, back, and paws thoroughly. After your dog has been towel dried, you can let them out the tub. Expect a bit of shaking to shower your bathroom walls, and don’t be too surprised at the amount of water you’ll have to wipe up. If you know what to expect, actually dealing with the mess isn’t so bad. Although your dog may tentatively enter the bath, once clean and dry, they will probably bound around the house wearing a smile. Using gentle shampoo, warm water, and a cheerful voice will help you and your dog have a stress-free bath time. can run around free after. These are such helpful hints for a less stress bath time. I agree that treats are important. Our dog doesnt mind a bath once he is in. Getting hm iin is a challenge sometimes, he is like a donkey he just wont come. He is silly, and loves being clean ., He is a large inside dog and it is a big production to get him clean! Geeze, I have no idea why I never thought of giving my dog treats while trying to bathe him. It has always been such a nightmare for both of us, I am going to give these tips a try the next time. Good tips to make bath time less stressful! These are great tips, and I do not know why I did not think of treats to help me give my dog a bath. But my dog is very passive and does not care what I do to him, so he does not put up much of a fuss when I give him a bath. My dogs are both about 85 pounds, so giving them a bath is a big chore. In our neighborhood we do have a dog wash that is a real help because it eliminates the need to bend over, I really like that a lot. I have four rescued Treeing Walker Coonhounds. I don’t bathe my senior girl right now – she is having trouble standing and walking and I know she won’t be here much longer, so I don’t think it’s necessary to bathe her (she stays inside most of the time and just potties and ocmes back in when she goes outside). For my other three, though, none of them like getting bathes. My girl, Kyoko, lets me, but you can tell she’s not happy about it. One of my boys, Kenji, freaks out and tries to tear down my shower curtain and gets water all over the place – I need my daughter to help with him. The other boy, Seiji, sometimes is okay and other times, too. I have to try to catch him in the right mood. My dog hates water and taking a bath. She just sits there shivering until it’s over. Even when I dry her off she runs around the house rubbing up against the carpeting. I am very fortunate that my doxie loves baths; however, my brother’s doxie does not like baths. She will cry/howl the entire time. Thank you for sharing these tips.